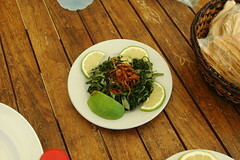 As served at the Tyre Rest House, South Lebanon, October 2008. Mark Bittman just blogged caramelized onions with lentils and rice. You and I know he really means mjaddarah, right? I get several hits a day from people looking for mjaddarah recipes. I first published it five years ago, from a recipe I'd put in a family cookbook and maybe posted to an old cooking newsgroup, too, I don't remember. The internet changes but mjaddarah never dies. Anyway, how cool is Mark Bittman for promoting our favorite onions with lentils and rice? This picture reminds me to braise some greens and garnish them with caramelized onions. Boil chicory+salt til soft, drain chop; carmlize lrg onion sliced in EVOO, add 4 clovz garlic, salt pepr, cook 2-3 mins, garnish lemon+EVOO. I am just now looking at this post, but this-lentils, rice and fried onions-is exactly what I made for dinner last night. I live in the east bay too-I reckon the craving must be in the air..I had it with cauliflower and garlic and some raw sauerkraut/kimchee. Highly recommend the combo! Thanks, Anne, for dropping by. The kimchee/sauerkraut suggestion is inspired; I will try it. Yum.